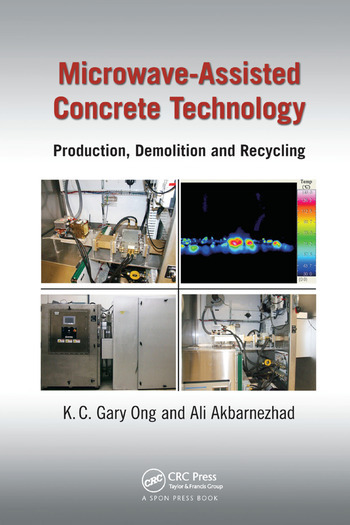 The first book to combine microwave-assisted heating technology and concrete technology (covering production, demolition, and recycling), Microwave-Assisted Concrete Technology: Production, Demolition and Recycling explains the underlying concepts and fundamentals involved in the microwave-assisted heating of concrete. While most books on microwave heating focus on the behavior of microwaves, this text centers on the response of materials subjected to microwaves, and specifically concentrates on materials used in the concrete industry. A ready reference for the design of microwave-based equipment, the book describes how microwave-assisted heating technology may be harnessed in the production, demolition, and recycling of concrete. It covers microwave-assisted applications, the design concepts of microwave heating systems (generators and applicators) used in microwave-assisted concrete-processing methods, and process control techniques used to monitor the condition of concrete during the heating process. The book is written from the perspective of modern practitioners in the construction industry, and addresses the technological, scientific, and environmental issues involved in replacing conventional approaches with microwave heating. The authors categorize the applications of microwave heating in concrete technology into three areas: microwave-assisted accelerated curing of concrete, microwave-assisted selective demolition and drilling of concrete, and the microwave-assisted recycling of concrete. They discuss sustainability and the environmental impact of incorporating sustainable concrete production, demolition, and recycling using microwave-assisted heating technologies, and environmentally friendly microwave heating applications. Dr. K.C. Gary Ong is an associate professor and deputy head (administration) in the Department of Civil and Environmental Engineering at the National University of Singapore. He is a past president of the Singapore Chapter of the American Concrete Institute, and of the Singapore Concrete Institute. His research interests include advanced composite materials, microwave-assisted concrete technology, durability and assessment of concrete structures, retrofitting, and sustainability; he has edited or coedited 18 conference proceedings and published more than 200 publications in journals and conference proceedings. Dr. Ali Akbarnezhad is a lecturer in the School of Civil and Environmental Engineering at the University of New South Wales. His main areas of research include concrete technology, design for sustainability, sustainability assessment, construction technology, and information technology; he has published more than 30 papers in leading refereed journals and conference proceedings. He has been involved in microwave heating research and development for more than eight years and is the inventor of two microwave-assisted techniques.